Black and White Print Bible / Book Cover is done in swirl pattered micro-fiber, with a screen-printed debossed text of Psalm 46:10, "Be still, and know that I am God;" on the front. The spine and back are made of black faux leather. Outside back cover has a handy pocket for notes. 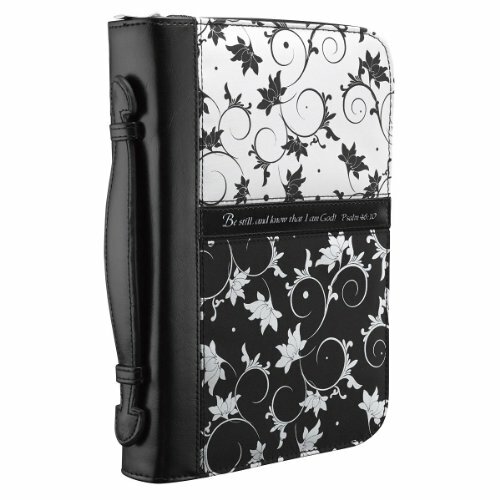 Bible cover features an exterior zipper with a cross engraved zipper-pull and a convenient lay-flat hand strap, a small zipped mesh interior pocket and 1 inside pen loop for easy access to your pen or marker. The Medium size accommodates Bibles such as The Holy Bible, NLT Reference Editions, Daily Study Bible for Women and The Life Application Bible – Personal size, or other books and Bibles up to 8.875 x 6.50 x 1.75 inches.